The Japan-European Union (EU) trade pact has sent a powerful message to the rest of the world, amid concerns over growing protectionism. For Japan though, it could just be the start of a record year for free trade deals, amid pressure from Washington for bilateral talks. On Thursday, Japanese Prime Minister Shinzo Abe, European Council President Donald Tusk and European Commission President Jean-Claude Juncker shook hands in Brussels on a free trade deal encompassing nearly 30 percent of global gross domestic product (GDP) and 9 percent of the world’s population. “Japan and the EU demonstrated our strong political will to raise the flag of free trade high when there are moves toward protectionism in the world. It’s a result we should be proud of and this is a powerful message to the world,” Abe said at a press conference. Reached before the start of Group of 20 (G-20) summit in Germany, the deal contrasts with U.S. President Donald Trump’s “America First” policy, under which the Trump administration has withdrawn from the Trans-Pacific Partnership (TPP) pact and sought to renegotiate other deals bilaterally. Politically, the pact is a boost for Abe after having championed the TPP, helping to expand exports without threatening a major backlash from the domestic farm lobby. For the EU, it has demonstrated the continued benefits of membership amid the existential threat posed by Brexit and other isolationist movements. 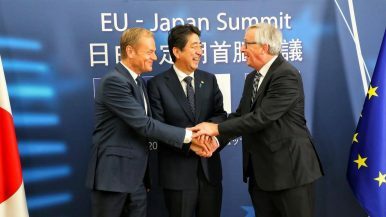 Reached after four years of negotiations, the Japan-EU pact will eliminate 99 percent of tariffs between the two partners, while also expanding markets for services and government procurement along with enhancing regulatory cooperation. Among its economic benefits, the deal could boost EU exports to Japan by 34 percent and Japanese exports to the EU by 29 percent. The EU’s gross domestic product (GDP) could grow by 0.76 percentage point and Japan’s by 0.29 percentage point. The EU also estimates it will save 1 billion euro ($1.1 billion) a year in customs duties, growing its exports to Japan to more than 100 billion euro. Japanese food lovers are set to benefit, with Tokyo to establish a low-tariff import quota for European cheeses such as Camembert, while eliminating tariffs on European wine imports and phasing out tariffs on goods such as chocolate and pasta. In return, the EU agreed to phase out its 10 percent tariff on Japanese passenger cars over seven years, as well as immediately abolishing tariffs on Japanese autoparts. Brussels also agreed to eliminate immediately tariffs on Japanese beef, sake, whiskey and wine as well as electronics. According to Japan’s NHK World, Japanese wine shops were considering price cuts on French wine following the deal, while autoparts makers and sake brewers were also eyeing its benefits. However, not all businesses surveyed welcomed the agreement. Akedori Cheese Factory’s Madoka Sato said cheaper European imports would increase competitive pressure on the firm. “All we have to do is to continue improving the quality of our cheeses, and provide new flavors to customers who want our goods,” Sato told the Japanese broadcaster. Shares in food-related stocks on the Tokyo Stock Exchange fell Friday, amid expectations of rising imports damaging domestic producers’ earnings. Among the losers were Megmilk Snow Brand and Rokko Butter, which dropped around 2 percent, while shares in Nippon Flour Mills hit a one-month low. The Japan-EU agreement will “lend momentum to negotiations for the TPP11 and other EPAs [economic partnership agreements],” with investors pricing in increased food imports, Daiwa SB Investments’ Soichiro Monji told the Nikkei. However, the Japanese economic daily also noted that Japanese food producers would also benefit due to lower prices of imported ingredients. “We have always maintained that the EU and Japan have ‘under-traded’ and that a catalyst like a trade agreement of this kind would unleash the real potential between the two economies,” the EBC said in a statement Friday. The EBC noted estimates by the European Commission that the trade deal could see EU exports to Japan of processed foods increasing by up to 180 percent and chemicals by more than 20 percent. Yet the European Automobile Manufacturers’ Association was more cautious, saying it would analyze the “full implications” of the agreement for its members. For Japan, the trade deal also represents a “breakwater” against U.S. pressure for a bilateral deal, according to the Nikkei. “Should that day come, Japan will be able to hold up the tariff reduction rates it agreed to with the EU on such goods as dairy products, beef, and pork and refuse any further concessions. The EPA with the EU would be the second such card in Tokyo’s hand, following a potential 11-member TPP that excludes Washington,” the newspaper said. The new pact could also strengthen the push for a TPP without its biggest economy. Representatives of the 11 nations remaining in the Asia-Pacific trade grouping are set to meet Wednesday in Hakone, Japan to discuss how to proceed without U.S. participation, which would reduce the economic size of the pact from 40 percent of global GDP to less than 15 percent. According to the Nikkei, Japan hopes to reach a general agreement among the TPP11 by year-end, minimizing changes to the original agreement. As such, it avoided going lower than it did in the TPP on cheese imports with the EU, compromising instead with a low-tariff import quota. Abe described the EU pact as “a major pillar in our economic growth under Abenomics,” helping give the nation’s sheltered farm sector another push toward reform. Yet potholes remain, including the sensitive issue of investor protection. Brussels has reportedly rejected the use of traditional investor-state dispute settlement tribunals, yet Tokyo is not keen on specific investment courts. However, should the parties overcome such issues, a detailed agreement is expected by year-end, with Juncker aiming to have the pact in effect by 2019, pending ratification by the European Parliament and the EU’s 28 member nations, along with Japan’s Diet. After the EU’s experience with its Canada free trade deal, ratification might not be a trouble-free process. But for the Abe administration, a win on free trade with Europe and the TPP could demonstrate its ability to achieve economic reform, amid domestic political challenges including the recent rise of Tokyo Governor Yuriko Koike. With net exports contributing to around three-quarters of Japan’s total GDP growth in the last five quarters, another export boost could prove vital in sustaining Japan’s longest expansion in a decade and helping ensure Abe’s political longevity.